It occurred to me, including because of the difficulties at times in communicating from Nepal, that many of you may be interested to know how I spent my time there. So I jotted down some of the highlights that I remember. From these you can see that, if anything, I am even busier with the study, practice and teaching of dharma in Nepal than I am here in the U.S., or anywhere else. Shortly after I arrived in January, I participated in an all-day (12 hour) chod ritual called tsog lay rin chen treng wa, or "the rosary of jewels feast ritual," an elaborate practice that I last did during the final week of my forty month Lama retreat in 1990. We were at least 500 people all playing the large chod drums and bells in unison. Chokyi Nyima Rinpoche bestowed the chod empowerment, and in the course of the day, we consecrated large statues of the eight great bodhisattvas that will go in the new temple in Lumbini. Several days later, Rinpoche invited me for a private lunch and visit at his personal retreat house in the mountains outside Kathmandu, where we had a good opportunity to discuss many matters of shared interest, a rarity given his very busy schedule and many responsibilities. He graciously agreed to do special prayers on behalf of Ivy's father who had just passed away in Singapore, and our family also made a number of offerings to the monastery dedicated to Mr. Loo's welfare and in gratitude for their support. Afterwards, over the course of five days, one of the senior khenpos at the monastery taught the complete (short) text by Rongzom Mahapandita called nang wa lha drup, or "establishing all appearances as divine," an important text that sets forth the Nyingma view of deity yoga and the nature of the two truths. That course was particularly timely, in that the following weekend I taught a course at the shedra (monastic college) to about 40 people on the Wisdom of Manjusri, including the commentary by Rongzom on "Professing the Qualities of Manjusri" that is translated in my recent book, which is based on the same views taught in his other text. The morning my course began, Chokyi Nyima Rinpoche gave a dharma talk in the temple to about 250 foreign students, after several hours of informal audiences in his interview room. In all, I spent the better part of 4 different mornings in that audience room during my trip, visiting with Rinpoche and closely observing his skillful bodhicitta activity with many hundreds of different people. As I always tell you, it is vital to learn from those who are more advanced on the path than we are. That week, I also participated with the Lamas in an all-day ritual in the main temple on Guru Rinpoche day, practicing the most elaborate form of the barchay kunsel sadhana known as trinley jay pa, or the extensive activity. I spent a day hiking up to Nagi Gompa, the hermitage of my first root guru Tulku Urgyen Rinpoche, where I practiced in his personal meditation room for several hours, visited with the nuns who are my longtime acquaintances, and had a wonderful visit with the Yangsid or current incarnation of Tulku Urgyen, who is a rapidly maturing youth of 14 years. As Losar approached, we performed the Ngag So (tantric vow mending) ritual all day in the main temple on the anniversary of Tulku Urgyen's passing. The following day, the five-day long vajrakilaya intensive ritual began, about 12 hours of group practice each day, with an 18 hour long day at the end, the final day of the Tibetan year, where we began practice at 2:30 am, held lama dancing in the courtyard in the middle of the day, performed an elaborate fire cleansing ritual at dusk, and returned to the temple to conclude and receive the siddhi (attainment) of the practice into the late evening. The next day, Losar, was a half day of sang and other practices in the temple, where thousands of devotees came to make offerings to the Lamas as well, followed by a very elaborate group offering to Chokyi Nyima Rinpoche by his students from around the globe. 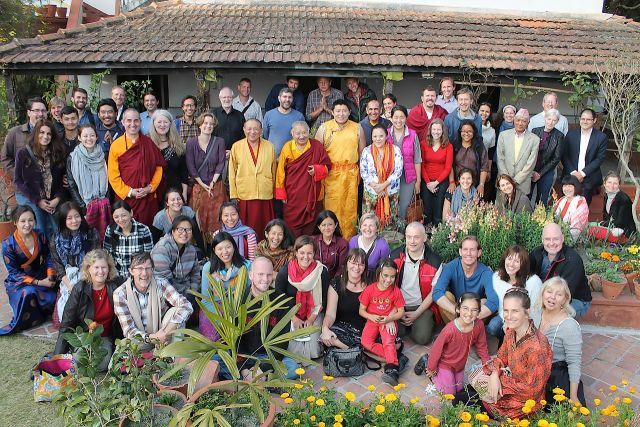 In appreciation, Rinpoche invited this entire group to a Losar picnic lunch at his private retreat house with his family, including Chokling Rinpoche, Pakchog Rinpoche, Tsoknyi Rinpoche, Tulku Urgyen Yangsid, and many other family members. Over the course of my stay in Nepal, I had many auspicious meetings with Lama friends and students, old and new, including a chance meeting with Ringu Tulku and his family around the Boudhanath Stupa, when we had a chance to talk about Rimay Monlams past and future; a meeting and lunch with Bob and Honora who were just passing through on their way back from pilgrimmage in Sikkim; visits with Lama Karma Justin Wall and his partner; a breakfast meeting with Lama Shenpen Hookham from Wales; a katag offering to Khenpo Tsultrim Gyatso Rinpoche; a dinner invitation to the home of Sang Ngag Tenzin Rinpoche, whose family in Golog had a strong connection with HH Kusum Lingpa; and visits with many other Tibetan Lama friends. From the eighth day of the first Tibetan month and for the following nine full days (about 14 hours each day), we held the Tsekar (White Amitayus Buddha) drupchen ritual in the main temple with many hundreds of participants. In all, I participated in 20 full days of group sadhana ritual during my stay. After the drupchen concluded, I offered another public talk at the Shedra, this time on properly unifying study and practice. We expect this talk to be available for anyone to hear shortly. With offerings I received during the pujas and from students attending my talks, I was able to commission a large drum and cymbals, which I brought back to Blazing Wisdom so we can begin to practice the Tara sadhana together, as well as a new set of copper shrine bowls. After many other meetings with sangha friends about a number of different projects in which I am closely involved, I finally left with Chokyi Nyima Rinpoche for the airport on the morning of March 11, just two days after the airport had reopened after a five-day closure when a jet rolled off the runway and could not be moved. Rinpoche flew off to China, and I to Bangkok, on my way through Stockholm and finally home. Click here to hear a talk titled "Advice on joining the study and practice of dharma" which I gave on Sunday, March 8, 2015, at Rangjung Yeshe Institute in Boudhanath.